The ELD mandate that took effect at the beginning of the year has been a hot button issue. The mandate’s purpose is to make the roads safer for everyone travelling them, so with it came a greater focus on the Hours of Service (HOS) requirements for drivers. If driving for more than 8 consecutive hours, required to take a break of at least 30 minutes before driving again. Note: this doesn’t pause your 14-hour clock. 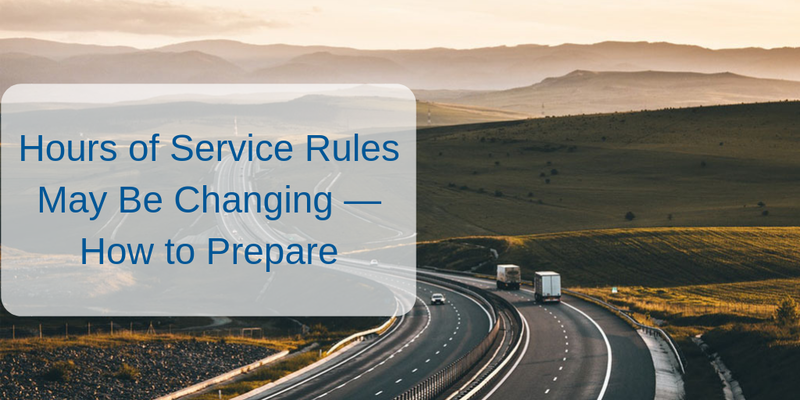 The pressure that these rules put on drivers has pushed the U.S. Department of Transportation to consider reopening its Hours of Service (HOS) regulations for interstate commercial drivers. Expanding the current 100 air-mile “short-haul” exemption to 14 hours on duty from 12 hours on duty, to be consistent with rules for long-haul truck drivers. Extending the current 14-hour on-duty limitation by up to two hours when a truck driver encounters adverse driving conditions. Revising the current mandatory 30-minute break for truck drivers after eight hours of continuous driving. Reinstating the option for splitting up the required 10-hour off-duty rest break for drivers operating trucks equipped with sleeper berth compartments. To allow covered commercial motor vehicle operators one rest break – for up to three consecutive hours – during every 14-hour on-duty period (filed by the Owner-Operator Independent Drivers Association). When speaking with American Trucker, OOIDA President Todd Spencer said, “the agency is finally listening and now the door is open for truckers to make their voices heard and to spur real, common-sense changes to the hours-of-service regulations.” If you want to view the official published document, you can view it on the Federal Register. The FMCSA has opened up the proposed changes for comments and public reaction and will make a decision form there. The deadline for submitting comments is September 24th — you can submit your comments here. Public forums are also being held to express viewpoints. The next one is September 14th — access the public listening session live stream here. These HOS changes are not guaranteed to happen, so having the right fleet management technology is a surefire way to help ease the pressure of the current HOS rules. Even if the changes do go into effect, there are still not enough hours in the day for drivers to complete every job. With quality fleet management technology, routes can be optimized to increase the miles drivers travel in a day. Keeping up with the HOS rules can be a tough task. Ease the pressure with the right fleet management technology. Contact us today and we’d be happy to discuss how we can help! bulk long haul commodity industries. Copyright Vertrax © 2019 All Rights Reserved.